Deer Hunting Tips. Welcome to the only deer hunting guide you will ever need. 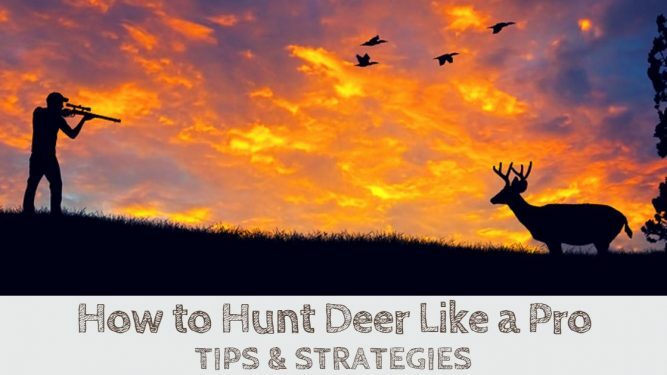 Loaded with all the basic deer hunting tips and strategies you need, this guide will help you get started and become a successful deer hunter. Hunting is a sport where you pursue, stalk and watch the animals, waiting for the perfect moment. That is the challenge and fun of deer hunting. Your skills are tested each and every time you go out there. Even when you don’t bring an animal home you still get the opportunity to refine your skills, making you a better hunter each time. In fact, most of the appeal of hunting comes from being outdoors, bonding with other hunters, enjoying the natural surroundings, living among the elements and cooking up some exciting stories to take back home. Hunting is a wholesome experience and not just about harvesting. We will load you full of knowledge so that any deer you face will make excellent table fare. So let’s get started. The more you know about deer the better you will be at hunting them. Deer are habitual creatures and hence becoming familiar would help you in finding deer during different seasons. The diet of deer is completely plant-based. Depending on the season, they migrate towards different food sources. They eat new sprouts of grass during the spring, fir tree needles in winter and grass or clover in late winters. 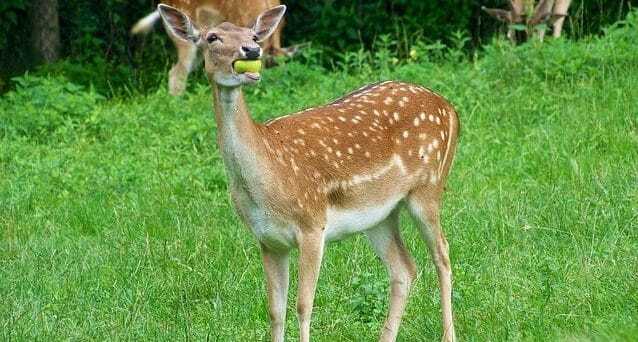 Deer will also eat fruits, nuts, fungi, moss and the local farmer’s crops if they can get away with it. They take their time as they eat, gradually moving along eating the tips of trees and shrubs. Look for signs like rows of missing tree limbs that are about deer height. If they feed here, then you have an advantage of knowing that spot is a good place to re-visit during hunting season. Feeding time starts at dawn and as long as they are undisturbed, deer will continue to eat until after sunrise. They usually sleep during the middle part of the day. It is worth remembering that deer will usually get up to feed for a short time around the middle of the day, but will return to bed again until nightfall. Feeding begins again late in the afternoon and will not stop until after sunset. You can also tell if deer frequent an area by looking for their droppings. While the droppings can vary in size, they are still pretty easy to spot. Typically you want to look for groups of about twenty to thirty cylindrical pellets, dark in color and with one flat end and one pointed. The piles tend to be around four to six inches in diameter. You need to be aware of the changes that diet has on the pellets. When deer eat a lot of moist vegetation, pellets tend to clump and will have a shiny appearance when fresh. You will be able to tell if the deer have been there recently using this information. Droppings do not necessarily indicate a recent deer showing unless of course, they are fresh. What it does tell you, is that it is an area frequented by deer, which offers you a good starting place in locating them. Deer want security when they choose a place to bed down. You can usually spot these trampled vegetation spots, measuring about three to four feet in length. Since deer travel in small groups, you may even see several flattened areas in close proximity to another. You should note that deer often return to the same bedding areas a few times over many days. Similar imprints can also be found in the snow during the winter. Now that you know these sites, you can effectively find a spot to set up a stand nearby to watch for their return. Deer are very habitual creatures, so you can even look for their travel paths. A deer trail may well resemble human footpaths because the ground will be significantly worn. You will also notice that any low vegetation has been cleared nearby. You can spot deer tracks easily; the hoof print resembles two teardrop-shaped halves imprinted side by side. If the ground is slippery then their hooves tend to leave more of a ‘V’ shape, so you need to look out for those too. 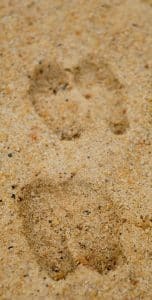 The standard size for deer prints is one and a half to three-quarter inches long. If the footprints are any smaller than they belong to the fawns. You can also often spot ‘Rubs’ and ‘Scrapes’ on deer tracks. Bucks rub their antlers against trees for communication and mating purposes. Rubbing leaves behind some of the velvet from the antlers and is easy to spot. You can look for these rubbing sites to identify frequented areas. Rubbing leaves physical evidence, a chemical from deer glands and if you are close enough, you can even hear the thrashing noise they make as they rub along trees. Antlers are bone white when velvet is first removed. Over time they get stained brown from plant compounds that accumulate from constant rubbing. When the plant chemicals mix with the air, they oxidize to form the brown coloring. Bucks will scrape as a way to mark their territory, to show their presence in a particular area and to advertise their availability to the does. During the rut, females look for the scrapes as a sign of who is ready for them. The bucks scrape their hooves on the ground at the base of a tree and also urinate on it. They also rub their orbital glands on branches that hang over the scrape. Once you are familiar with what these sites look like, it will be easier for you to identify locations that deer are frequenting. Most hunters these days use modern firearms due to their ability to shoot with extreme accuracy over long distances. The hunting season for modern equipment also coincidentally happens to fall at the same time as the rut season for deer. Modern firearms include rifles, pistols, shotguns, and crossbows. You may get overwhelmed by the choice of rifles available. Popular calibers for deer hunting include .243, .270, .308, 7mm mag and all type of .300 magnums, which can be found at any of the major sporting goods retailers. You want to shoot with confidence and accuracy because getting a deer involves a shot right into the vital organs. Any of the above-mentioned rifles will do this for you. Bullets for these rifles also vary in terms of weight and material. ‘Grain’ is the measuring unit for the weight of a bullet. The heavier a bullet, higher the energy that gets transferred to the animal at the point of impact. When you are hunting deer, you will want to use a 100-150 grain bullet which mushrooms on impact. Bullet design impacts how it will act when it hits the target. Bullets with polymer tips tend to mushrooms wider and faster. Ammunition manufacturers also produce bullets loaded with copper, specially designed for hunting big games. These bullets really perform well and are gaining higher acceptance in the field. For all big game, you want to be sure you have a bullet which will transfer its energy into the target. You can choose a handgun although its use is not as widespread as other choices. You will want to make sure you choose the right bullet, one that will effectively do what you need. Consider the bullet weight carefully and find out if it will have enough impact to cause a humane kill. The use of shotguns is generally confined to specific restricted areas. Some shotgun manufacturers also make rifled barrels which allow shotguns to provide higher accuracy when used with a rifled deer slug barrel. Crossbows for hunting have been legally allowed since 2015 and have gained popularity due to their speed, stealth, and accuracy. You should choose comfort over trend every time. Unless you are comfortable with your clothing and camouflage, you will not be able to enjoy the experience. In this section, we will provide tips for selecting the right boots, clothing, camouflage and orange hunting vests. You should choose boots which provide proper ankle support for your feet and also keep them warm and dry. Trekking through all sorts of land, the last thing you want is soggy cold feet. Some boots even offer insulation. We advise that you think about the type of hunting you will be doing, the terrain and temperatures, and then decide on the boots that will be best. Since you already know that deer are out during the dark and cold parts of the day you need to dress warmly. But, you are also going to be scouting during the heat of the day. Layered clothing will make sure you can be covered for temperature changes over the course of the day. You can remove or add layers as needed, staying comfortable all day. Hiking up to steeper locations will warrant having protection from cold and winds once you get there, but as you hike and work up a sweat there will not be a need for the layers. It is always a good idea to wear tough jeans or tactical pants as you trek through different areas. There are so many choices, that the best recommendation is to simply match the camouflage with the environment you are headed to. The purpose of camouflage is to blend your outline with your surroundings. Since animals are scared of humans, the last thing you want to look like is a human shaped object. Most large camouflage companies have multi-purpose camo patterns that can be used in several different locations, so if you aren’t sure where you will be hunting, this is a good place to start. As a novice hunter, such multipurpose designs are a good idea until you get used to the different hunting environments. You can also use regular clothing as long as the colors are green, black and brown. Always remember to use camouflage paint on your face and camouflage your hand using gloves. It is required by law for every hunter to wear a minimum of 144 to 400 sq. inches of visible orange clothing above the waist. There are different blaze orange regulations for each state. We advise that you wear more for your own safety! To get the most out of the orange, buy something like a bird vest which can be used during different hunting seasons. 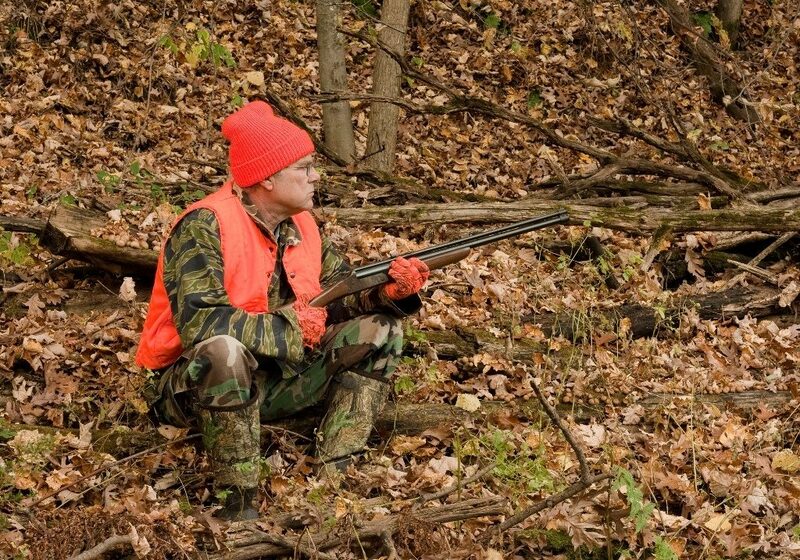 Orange hats are highly recommended when in hunting in areas with tall grass or in forests. They are clearly visible from greater distances, therefore, increasing the chance of other hunters seeing you. When it comes to blinds and tree stands, be sure you have the permission of the landowner when on public land. The agency that owns the land may have regulations for erecting such items. Blinds are becoming increasingly popular because of their ability to disguise you from the excellent vision that deer have. They pop up on the ground and provide complete coverage, making you invisible to any of the deer that might be watching. Ideally, you want to set the blinds up before your hunt, so that animals become accustomed. You can also add brush around the blind for additional cover. You may grab any nearby vegetation for the brush. Also, ensure the back is zipped up so as not to expose your silhouette. Be sure to set the blind up the wind in your face. Once inside the blind, your movement should be minimal so that you are totally concealed. Tree stands attach to a tree, bringing you above ground level for a more accurate bird’s eye view. They are great for getting a different view of the land. Some tree stands require a ladder to place it on the tree and others allow you to climb the tree (climbing tree stands). You should wear the safety harness to avoid any accidents. One of the most valued items in your hunting toolbox will be good quality optics. Spotting scopes and binoculars are the popular choices. With these, you can accurately scan large areas to locate deer, without having to hike around. Spotting scopes or binoculars also allow you to take a closer look at the animal so you can be sure it is legal. We do not recommend using the scope of your rifle to scan for animals due to safety reasons. If you accidentally discharge your weapon while glassing, you could end up shooting a non-legal animal or another non-game animal. We would recommend testing the spotting scope or binoculars at the sporting goods store before deciding on which one to buy. You will always get what you pay for. Cheaper optics will work but will not last. Of all the hunting equipment you can get, this is the one to spend on because good optics will last your hunting career and can even be used for other things. Some other useful optics are trail cameras and night vision scopes. Deer Calls have recently been gaining in popularity. The most well-known is a grunting or rattling sound that imitates two bucks fighting over a doe. This call tends to be more popular in Midwest regions, specifically with white-tailed deer. It is highly effective when used during pre-rut times when the buck to doe ratio is high. You can also use a grunt tube, which mimics the sound of one buck challenging another. Another popular call is Doe Bleat which makes the sound of a doe in estrus which works great during the rut. Grunt Tube: Makes grunting noise similar to that of bucks challenging each other, or letting them know when they are in the area. This is more effective when used along with rattling calls. Rattling calls: Makes the noise of two bucks fighting. This call is popular and extensively used in the Midwest during the pre-rut season. Doe Bleat: What better way to get the attention of buck than making a sound like a doe in heat. Use this call during the rut season and the bucks will come running! The selection of knives in sporting goods stores is immense, with different shapes, sizes, uses, designs, and materials. Find one that works for you and is comfortable to use. Always keep a knife sharpener with you to touch up the blade as needed. Any knife can be used to care for your game, but you may also want a bone saw, which will come in handy when dressing a deer and have to cut through the pelvic bone. Skinning knives can be identified by their deep belly in the blade, which helps prevent you from cutting through the hide. Some models also have a gut hook which is designed to cut open the chest easily to remove the entrails. Boning knives are straight and thin, so they can easily cut meat away from the bone. Caping knives are short and you can use these to remove the skin from the head of the deer. The short blade allows you to perform more detailed work so you can have your harvest mounted. Bone saws are good for cutting the pelvis. You want to do this so that the intestines can be easily lifted out rather than dragging them through the entire body cavity. If you want to hunt on private property, you need to first scout the area and locate the lands where you specifically want to go. You can then speak to the landowner about the property. Not all of them will agree to let you hunt there, so remember to be courteous and thank them anyway. The more persistent you are the more access you can get to lightly hunted areas, with the added benefit of making friends at the same time. You can also choose to join hunting clubs or hire a guide that can access private lands and ranches. Stand hunting strategy is like an ambush, where you get in position along a trail or known deer area and wait for the deer to show. You will most likely want to use a tree stand for comfort but can also just lean against a tree. Still hunting is where you will quietly move through deer areas hoping to see deer before they see you. This is perhaps the most challenging strategy because you have to move like a snail, taking maybe three steps at a time. You need to be aware of the wind so you can position yourself in a way that prevents them from smelling your presence. In the Spot and stalk strategy, you will survey areas where deer are likely to be, using your knowledge of what signs to look for. When you see a deer, you sneak into range hoping to get a shot. This technique works best in open habitats when you can see deer from a distance. Driving involves a combination of stand and still hunting. A group of hunters is divided into drivers and blockers. Blockers set up where deer are likely to pass once they have spotted you and drivers advance towards blockers hoping to push a deer in that direction. The season for hunting black-tailed deer is close to the end of the general season when the overgrowth of vegetation makes it easy for you to stalk and move through the woods. Ideal hunting conditions occur during the late buck hunt which is where this favored weather and breeding season combine. Black-tailed deer are nocturnal by nature. You need to take advantage of this by hunting near the food source and getting into position early in the morning. Whitetail deer tend to congregate in valleys and the bordering foothills. They thrive in the farm and forest borders. You specifically want to look for white-tails by stream drainage areas and areas with thick vegetation cover. Areas along the edges of dense cover and open meadows are where they are most vulnerable. 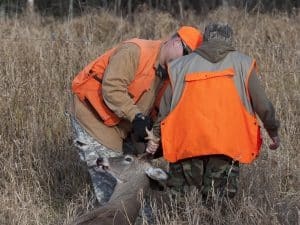 Best techniques for hunting Whitetail deer are ‘Still hunting’ and ‘Stand hunting’ particularly in highly frequented areas (trails, bedding areas, funnels etc.). You should set up a tree stand adjacent to forest edges or deer trails and patiently wait for the white-tailed deer to show up. The best time for you to see mule deer will be at dawn and dusk as they prefer a little darkness. You can typically find mule deer foraging into open spaces. You can easily view and stalk them from a distance using a spotting scope or binoculars. The traditional technique for hunting Mule deer is ‘Spot and stalk’. In this technique, hunters use spotting scopes or binoculars to spot mule deer from a distance and then sneaking up to within the shooting distance. Shot placement is critical because you always want to take shots that make the most humane kill possible. You will only be able to do this when you are 100 percent confident in that shot. Practicing before you hunt is the best way to build confidence. We can also help you by letting you know the best places to put a shot. Before taking a shot, check around to make sure there are no obstructions. Even a small item like a branch can drastically change the bullet trajectory. In the field, you will have a number of shots you can take and we want to help you make sure you take the best ones. Remember that if you are in a tree stand, you will need to aim slightly higher to adjust for the angle. We have discussed some of the more common aims below. By far the best shot you can have. Vital organs are easier to hit with this hot so this is the best option for inexperienced or novice hunters. The projectile will go through both lungs and potentially the heart too. This is also fairly efficient but can be more challenging. The object is to hit the tail end of the lung closest to you and the middle of the lung furthest from you. While that description seems tricky, the bottom line is to aim for the opposite shoulder of the animal. This one is more difficult due to the presence of higher number of bones that can be hit. You should never take this shot with a crossbow as the chances of hitting rib or shoulder are very high. There is also a chance that the deer sees you as you draw and release and move, thus changing the impact point of your arrow. If you are using a rifle, then this is not a problem since most modern rifle bullets can pierce bone. You should generally avoid this shout as your chances of hitting a vital organ are extremely low. This shot might be viable if you could hit the heart but the bullet would most likely also rupture the stomach causing the release of digestive juices. Crossbow hunters should never take this shot. You should never take this shot as there is little chance of hitting a vital organ, compared to the other shots. You will most likely rupture intestines, stomach and other areas causing the same problems as a head-on shot. This is a very necessary skill in the retrieval of game, but it can be hard to learn. There would be times when you hit an animal well, but it still manages to run off into the brush. There is not a hunter out there that has not lost sight of their deer. The first thing you do is go to the spot where the animal last stood at the time of your shot. This is where it comes in handy to have a hunting partner because one of you can go look while the other stays back at the spot where you shot from. Look around the immediate area for blood so you can determine the kind of hit animal took. If you see bubbly blood it means a lung shot, dark red blood is for heart shots and black blood means a liver shot. Always keep an eye on the ground for blood trails. You will want to walk in slow circles checking for blood. Make sure you mark the last spot you saw blood and circle out from there about ten feet, looking for the next drop. It is a very slow and methodical process but you need to continue if you are to find the animal. It usually takes about 30 minutes for the animal to lie down and expire, so wait, watch and listen for any signs that the animal may be down. In the event, you hear the animal get up and run, wait another 30 minutes and start the tracking process over again. Once you locate the animal, always approach from behind and poke it first to ensure that it is dead. If the deer is still alive, you need to kill it then and there in the most humane way possible. When you have retrieved your animal, you must immediately attach your transport tag. Once a big game has been killed, you must validate your tag by cutting out and removing the month and day of the kill. You need to securely attach the tag to the carcass so it is visible. Most hunters use electrical tape to attach the tag to the antlers. This process involves removing the animal’s internal organs. You need to do this as soon as possible after the animal has been recovered. The sooner it can be done the less chance there is for intestinal or stomach fluids to leak and make contact with the meat. There are a number of ways to field dress a deer, so our best advice is to search for a field dressing video online to learn the ropes. Removing the skin helps the animal to cool faster. You can either skin it while it’s on the ground or hang it from a tree. You can even buy a gambrel and pulley to lift the animal up. Processing can be done by yourself or you can take the carcass to a local butcher. You will have to pay a fee to the butcher. But it may be the best bet to get all the best cuts. We hope you found this article on Deer Hunting Tips & Strategies helpful and informative. Our goal is to get you up to date and ready to go. Loaded with knowledge, you can now get prepared for your hunting trip with confidence and excitement. Great information on deer hunting for beginners! But just a word of advice, always check the hunting laws as they can vary across states. For example, in some states, it is illegal to hunt with a rifle, hunt with dogs or use baiting techniques. Though, why some states have such restrictions is beyond my understanding. Lovely post. I’m a really found of hunting. Though my preferred game are squirrel and rabbit, I am learning to go after deer. I’ve been hunting for many years, and this article is a great introduction to deer hunting. One thing I would add is .25-06 Remington cartridge for beginning deer hunters. The .25-06 is expensive but punches well higher than its class. .260 Remington is another one that doesn’t get much recognition but is a good choice for beginners. What a blog mate! It is a great idea to write this for the new hunters. I have been deer hunting for many years and I found a couple of good tips here. From now on I will be referring newbies to your article which is very detailed and self-explanatory. Thanks Victor! Definitely a good resource for beginners. What’s crazy is even this detailed article just scratches the surface of all the hunting knowledge out there! This was an interesting article. I will try to use the information here to be a more successful hunter. Thank you for great tips. I learned many of these the hard way last year. Hunted 2 weeks and most days I was out from early morning till late evening. Didn’t spot a single deer! I am a beginner deer hunter. Thanks for your tips. I like how you have written this post for beginners. Thanks for sharing these awesome tips! I will share your post with my friends who are new to hunting. They will appreciate this. I like that you written about the basics of deer hunting and the equipment used. Also, the other points on deer handling are useful because we love to replace regular meat with deer meat in the winter. I think other bloggers writing about deer hunting should take note of this article. Very detailed and beginner friendly content. Spot on about deer hunting. A lot of useful tips and strategies for hunting deer. I love reading blogs like this while enjoying an ice cold beverage. Great article on deer hunting. Some really good tips! Keep up the good work!